This model does not run in OpenCell or COR due to missing parameter values. ABSTRACT: Previous models of the cerebrovascular smooth muscle cell have not addressed the interaction between the electrical, chemical, and mechanical components of cell function during the development of active tension. These models are primarily electrical, biochemical or mechanical in their orientation, and do not permit a full exploration of how the smooth muscle responds to electrical or mechanical forcing. To address this issue, we have developed a new model that consists of two major components: electrochemical and chemomechanical subsystem models of the smooth muscle cell. Included in the electrochemical model are models of the electrophysiological behavior of the cell membrane, fluid compartments, Ca2+ release and uptake by the sarcoplasmic reticulum (SR), and cytosolic Ca2+ buffering, particularly by calmodulin (CM). With this subsystem model, we can study the mechanics of the production of intracellular Ca2+ transient in response to membrane voltage clamp pulses. The chemomechanical model includes models of: (a) the chemical kinetics of myosin phosphorylation, and the formation of phosphorylated (cycling) myosin cross-bridges with actin, as well as attached (non-cycling) latch-type cross-bridges; and (b) a model of force generation and mechanical coupling to the contractile filaments and their attachments to protein structures and the skeletal framework of the cell. The two subsystem models are tested independently and compared with data. Likewise, the complete (combined) cell model responses to voltage pulse stimulation under isometric and isotonic conditions are calculated and compared with measured single cell length-force and force-velocity data obtained from literature. This integrated cell model provides biophysically based explanations of electrical, chemical, and mechanical phenomena in cerebrovascular smooth muscle, and has considerable utility as an adjunct to laboratory research and experimental design. 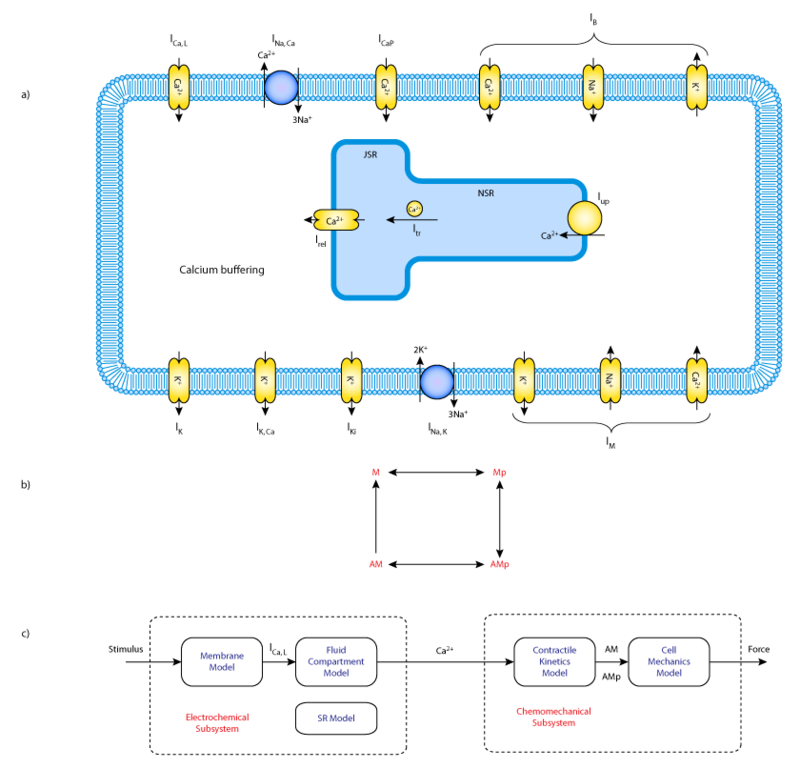 Schematic diagrams of: A) the electrochemical model; B) the multi-state kinetic model of CaCM dependent myosin phosphorylation and cross-bridge formation; and C) functional block diagram of the whole integrated smooth muscle cell model. Derived from workspace Yang, Clark, Bryan, Robertson, 2003 at changeset 43e5ab4e3646.